This is the first game in the Castlevania series. For other games in the series see the Castlevania category. For the SNES game with the same Japanese name, see Super Castlevania IV. Castlevania, known in Japan as Akumajou Dracula (translated as "Demon Castle Dracula"), is a game developed and published by Konami for the Famicom Disk System in Japan in September of 1986. In May 1987 it was ported to cartridge format and released in North America for the NES followed by a European release in 1988, and then once again in Japan in 1993. It is the first game in the Castlevania franchise, but the seventh chronological installment of the franchise in the current canon. Castlevania is a typical platform game of the 8-bit era: the game comprises six levels, which are played through in a strictly linear progression. The player controls Simon Belmont, whose primary mode of attack is via his whip, which can be upgraded by obtaining special items throughout the course of the game which extend its length. In addition, various "sub-weapons" can be obtained which provide different means of attack. By breaking candelabra, torches, and fake walls located throughout the castle, Simon collects hearts, which can then be used to activate whatever sub-weapon he possesses at that point. Simon can only carry one sub-weapon at a time. Each of Castlevania's six levels conclude with a boss fight: these bosses are generally taken from horror literature or legend, and include Frankenstein's Monster, Medusa, and Death. Castlevania has been ported to a variety of different video game consoles, handheld game consoles, home computer systems, and mobile phones. The NES release of the game was adapted for video arcades both as a part of Nintendo's Play Choice 10 series and (with the addition of a two-player competitive play mode) the Nintendo Vs. Series as Vs. Castlevania. In 1990, versions of the title were released for MS-DOS, the Commodore 64 (both developed by Unlimited Software), and the Commodore Amiga (developed by Novotrade). In 2002, Konami released the first three NES Castlevania games for Windows as the Konami Collector's Series: Castlevania & Contra. This was later added to GameTap in 2006. In 2004, Castlevania was released for the Game Boy Advance as part of the Famicom Mini and Classic NES Series. In 2007, it was released through the Wii Virtual Console. 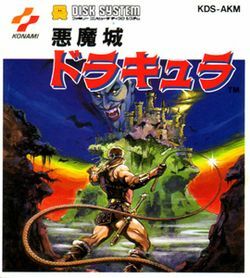 The game has been adapted or remade for a number of different platforms, including the MSX2 (known as Vampire Killer in Europe), the SNES (as Super Castlevania IV), and the Sharp X68000 (which was later ported to the PlayStation and released as Castlevania Chronicles), as well as an arcade game remake called Haunted Castle. While all of these adaptations share a variety of elements with the original game, including title (in the original Japanese, all were simply called Demon Castle Dracula), basic storyline, main character, and monsters, several major elements have been added or altered, and because of this they should be considered as distinct entries in the series. It is the year 1691...The land of Transylvania has been at peace for one-hundred years now, thanks to the efforts of Christopher Belmont. The peasants and villagers have begun to purge their minds of the memories of the times when the lands were dominated by chaos and shadows, times when the undead walked the earth...However, there are those that remember that the evil Count Dracula returns every one-hundred years to plague the land, bringing with him the forces of Hell...Thus, one evening, the Prince of Darkness rises and returns to Castlevania, his ancestral home, calling forth his minions to purge the world of human flesh. This page was last edited on 20 February 2018, at 07:41. This page has been accessed 118,880 times.